Hopeful Monsters takes its title from the theory of macro-mutation or large mutations first proposed by German geneticist Richard Goldschmidt (1878 – 1958). Goldschmidt proposed that mutations occasionally yield individuals within populations that deviate radically from the norm and referred to such individuals as “hopeful monsters”. Under the right environmental circumstances, these may become fixed, and the population will found a new species. Hopeful Monsters is a speculative journey into a sort of transitional morphology, plant, insect, animal. To borrow a phrase from the science fiction author Jeff Vandermeer, I am interested in exploring what happens when the natural world around us becomes a kind of camouflage. 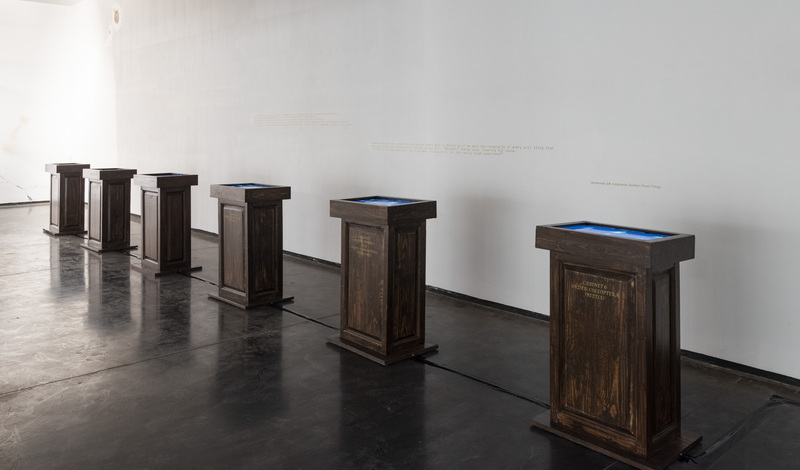 Hopeful Monsters, video installation, 6 channel video work, looped, Framed 24 inch tv’s screen on pedestals.